What would Harrison do for a Klondike bar? Be quiet? 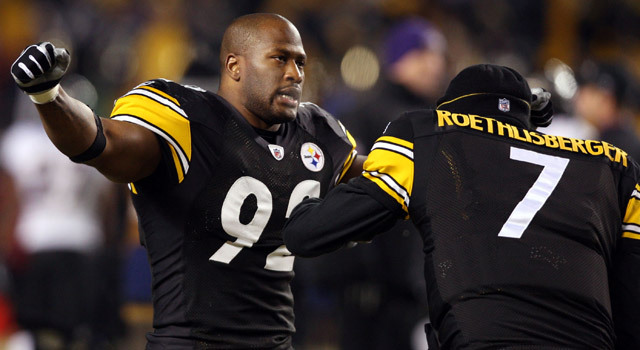 Published: July 14, 2011 at 08:35 p.m.
James Harrison (left) needs to mend some fences with Ben Roethlisberger before they ever hug again. Life would be awesome with a reset button. Sent a drunk text to your boss? A reset button would be cool. That third shot of Jaeger? Yeah, a reset button would be super cool. But life doesn't work that way. And when you say, "If (Roger Goodell) was on fire and I had to piss to put him out, I wouldn't do it. I hate him and will never respect him," well, you can't hit reset on that. And a half-hearted apology won't cut it either. James Harrison likely stands by his feelings about Goodell. But what the enigmatic Pittsburgh Steelers linebacker probably regrets is putting his quarterback, Ben Roethlisberger, on blast. Not that Harrison doesn't have strong feelings about his sometimes mistake-prone quarterback. Men's Journal writer Paul Solotaroff joined the "Dave Dameshek Football Program" on Thursday afternoon and said as much. But Solotaroff did say that Harrison likely would back off his harsh criticism of Big Ben because the two need to coexist in the locker room. And that's exactly what Harrison did Thursday night. James, words are cheap, and so is your letter. Here are six real ways you could make it up to Roethlisberger. Hey, who wouldn't like to save on their auto insurance? And considering Roethlisberger's history with motorcycles, his premium probably is kind of high. Too soon? The best way to get on Roethlisberger's good side is to give him another receiver to catch his passes. So helping convince Burress to re-sign with the Steelers might be a good way to break the ice. Or course, if you want to go the extra mile, you always could convince a couple of offensive linemen to join the team, too. The social event of the season has to be the new Harry Potter movie. How hot is this ticket? Advance sales have reached $32 million. And hey, James, if Big Ben asks you to pay for the popcorn, you probably should, even if you don't think you said anything wrong. 3. Klondike bars after practice! Take it from a husky guy (be polite, haters): You can't go wrong by giving us ice cream. Especially after a hard practice. Honestly, who could be upset when somebody gives you a Klondike bar? Trust me: Nothing heels the feelings of a husky man like a tasty dessert. James, you've been invited to Big Ben's wedding this weekend, and that's a good thing. Now keep the revolvers at home. And if they're passing around a microphone so you can toast the newlyweds, please defer to somebody else. You don't want it to end up like Steve Buscemi in "The Wedding Singer." Got a better one? You can send more suggestions via Twitter or via Facebook. Be sure to catch the latest on the Dave Dameshek Football Program. "Pick Six: Going out on a high..."